Higer R-value than other insulation types. Highly adhesive; sticks permanently to all common building materials. Closed-cell SPF is waterproof; it won’t absorb or be damaged by moisture. Expanding action effectively fills gaps and seals leaks. Spray foam provides air-sealing and insulation in a single step. Spray foam insulation is one of the newest and most-advanced types of insulation available. 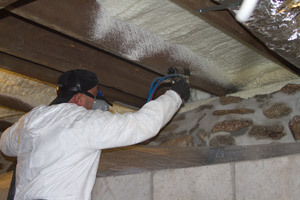 More and more home and business owners are choosing to have spray foam insulation installed because of its unique properties. Unlike fiberglass and other “fluffy” insulation materials, Spray Polyurethane Foam (SPF) can’t be damaged by moisture. Once installed, spray foam won’t ever fall out of place or lose its R-value because of compression like fiberglass can. Is your basement uncomfortably cold during winter months and unpleasantly damp in the summer? Spray foam can help solve both problems. Our SPF application will seal leaks in your foundation’s perimeter that allow cold and damp air to leak into your basement. Advanced Basement Systems uses a special closed-cell spray foam formulation called POLARFOAM 7300, a Canadian-made product supplied by a leading Canadian SPF company. In basements and crawl spaces, we recommend sealing and insulating the rim joist area with POLARFOAM 7300 to improve comfort and energy efficiency. The SPF application process involves special equipment that enables the installer to mix two compounds at the application nozzle. The resulting chemical reaction creates an expanding foam that seals and insulates in a single step. POLARFOAM 7300 also cures quickly, becoming hard and impermeable in just a matter of minutes. Skilled, well-trained technicians are key to a successful application. That’s why it’s smart to call 1-844-320-1542 with all your spray foam questions and needs. We work in Chatham, London, Sarnia, Windsor, St Thomas, Stratford, Windsor , Essex, Amherstburg, Strathroy, Leamington and nearby in Ontario. Most basements have too little insulation and too much air leakage. Professional spray foam application will correct these deficiencies, making your home more comfortable and less expensive to heat and cool. Contact the spray foam experts at Advanced Basement Systems to schedule a free inspection and spray foam insulation estimate.